This stone is from the old Santa Rosa Rural Cemetery. 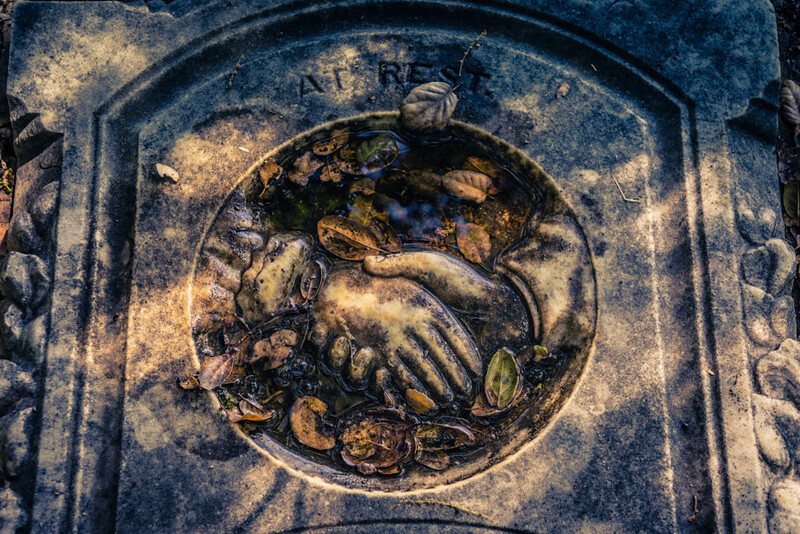 I found this same symbolism on many of the gravestones there... some with female hands on top and some with male. When checking this particular symbolism, there were a couple different meanings. Sometimes it symbolized who died first and sometimes it was seen as whoever died first, guiding the other to heaven. Either way, I found it beautiful and serene. Especially the way the water and dead leaves filled in the crevices of the circle, but not the borders. Nature was definitely a participant in the creation of this photo... It just goes to show that wherever you look, you will always find beauty and art. So today, take a moment to look around with an artists mind and allow yourself to see and feel the beauty of unexpected art.